We were delighted to hear of the academic success of two former CMcK students. Kate Henson (Wellington Girls) and Sebastian On (Wellington College) have been awarded Dux of their respective schools. We congratulate them on the resilience they have shown to achieve their academic results. You may not be aware that our school is the evacuation point of the Ministry of Education Response team during events that effect Wellington. Schools have done a great job responding to the challenges brought about by this morning’s earthquake, Acting Secretary for Education Katrina Casey said today. “The majority of principals were in early checking their schools and contacting their parent communities. These earthquakes have been a really big event for many across large parts of the country, particularly those in North Canterbury, Marlborough and Nelson and Wellington,” Ms Casey said. “Schools offered support to others in their communities including the use of facilities, particularly as examination centres. For example, Marsden Collegiate in Karori, offered schools to use some of its examination rooms.” In all, 276 of the 524 school in the affected areas of Canterbury, Nelson/Marlborough and Wellington were closed today. “We advised schools to close this morning so that buildings could be inspected. Thankfully, most of the damage has been minimal which means most will be open tomorrow. “We have asked structural engineers to assess schools with more obvious damage, to ensure they are safe “Secondary schools have been our top priority because their students are sitting NCEA exams. We’ve not been advised of any significant structural damage in Wellington, Canterbury or Nelson, so most schools that were closed in these areas today are expected to be open tomorrow, subject to final checks. “That includes most secondary schools and area schools. As far as exams themselves are concerned NZQA informs us that where schools are open, exams will be going ahead. “Where schools are closed, or if students sit an exam and believe their performance has been affected by the earthquakes, students can apply for a derived grade. “Looking ahead, we do need to do some final engineering checks at a small number of secondary schools but we expect the majority will be open. 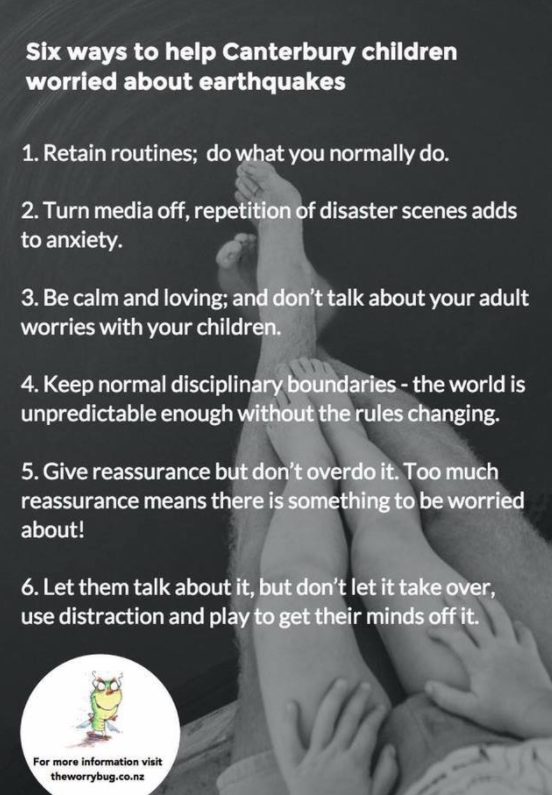 Ways to respond to the Earthquake with Children.